UB lost to Minnesota 17-7 but the fan base needs to be encouraged about two things. One, the run defense looked great against a good power running game of the Gophers. Last year UB allowed 251 yards a game on the ground at a clip of over 5 yards a carry. Against Minnesota they allowed 169 yards at only 3.3 yards per carry. Secondly the emergence of Anthony Johnson as a clear number one stud receiver was a beautiful sight to Bulls fans. Johnson caught 11 passes for 140 yards and a touchdown. More importantly he forced the Gophers off of press coverage and into a zone for the entire second half. Next up another tough ground game attack when the Bulls travel to Army on Saturday. Mason Rudolph of Oklahoma State and Baker Mayfield of Oklahoma were near perfect in their first games. Rudolph was 20 of 24 for 303 yards and three touchdowns in a 59-24 blowout win over Tulsa. Mayfield completed his first 16 passes in the Sooners 56-7 win over UTEP. On the day he only missed one pass completing 19 of 20 for 329 yards and 3TD’s. Mayfield has a tougher test Saturday in the Horseshoe against Ohio State. Lamar Jackson looked like a one man show against Purdue. Jackson got little help from his offensive line or running game in a much closer game than expected. Jackson compiled 485 yards rushing and passing and three touchdowns in the Cardinals seven point win. Jackson did have a fumble on the Purdue 2 early in the game. He only got 41 rushing yards from his backs. This Louisville team doesn’t look like it has the cast around him like they did last year. Josh Rosen looked horrible in his first three quarters against Texas A&M. The Bruins then made a historic comeback down 44-10. 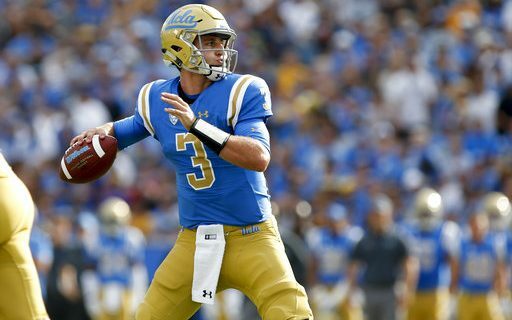 Thirty-five unanswered points gave UCLA a 45-44 win. Rosen threw for 289 yards and four TD’s in the fourth quarter alone. His fake spike to win the game was like Dan Marino against the Jets years ago. When evaluating this game it’s hard to forget the first three quarters when Rosen didn’t look good. His TD to make it 44-31 went right through the arms of an Aggies DB. I’m just saying you might want to pump the breaks on all of the Josh Rosen love. This is a game that could get Kevin Sumlin fired. The worst start of the weekend came from Wyoming’s Josh Allen. Iowa was all over Allen in a 24-3 Hawkeyes win. He finished 23 of 40 for only 174 yards and two picks. Both picks were very poor decisions. In his defense he had no running game a poor offensive line and a TD dropped. Fact is so far he has played two power five games last year vs Nebraska and Saturday against Iowa. In those two games his combined stats are 39 of 72 (54%) with one touchdown with seven interceptions. He plays Oregon later this month. He better have a better game against the Ducks. A Heisman candidate was on display as USC beat Western Michigan but it wasn’t QB Sam Darnold. Ronald Jones II ran for 159 yards and three TD’s. More importantly he looked like the best player on the field. Sam Darnold was sacked three times against Western Michigan. Darnold was sacked only six times all last year. He threw two picks but both were on deflections. The Trojans won a hard fought 49-31 contest. On Friday WR Dante Pettis bailed out a lackluster Washington team to lead a come from behind 30-14 win over Rutgers. Pettis had a punt return for a TD and setup the Huskies first three scores. QB Jake Browning got crushed on a sack in the first quarter and was less than impressive on the night. Sad news coming out of the Florida State-Alabama game. Seminoles QB Deondre Francois will miss the rest of the year with a knee injury. Bob Gaughan has worked in Buffalo media for over 25 years. He spent 15 of those years as a staple on WGR radio as a talk show host and sports director. Currently, Bob works for UB Athletics on the radio broadcast of football and women’s basketball. Off the air, he has been an adjunct professor for over 20 years at Buffalo State College where he developed and has taught a class on how to be a talk show host.